When we were in St. Augustine, we passed a restaurant that sold all types of cheesesteaks. I was really curious about the chicken, buffalo chicken and pizza cheesesteaks. All the food smelled delicious! We ended up eating next door at the A1A Ale Works. It was good, but we definitely need to check out the cheesesteaks next time. I love to make quick crescent sandwiches for dinner. They are so much more exciting than plain ol' cold cuts, and they taste delicious. 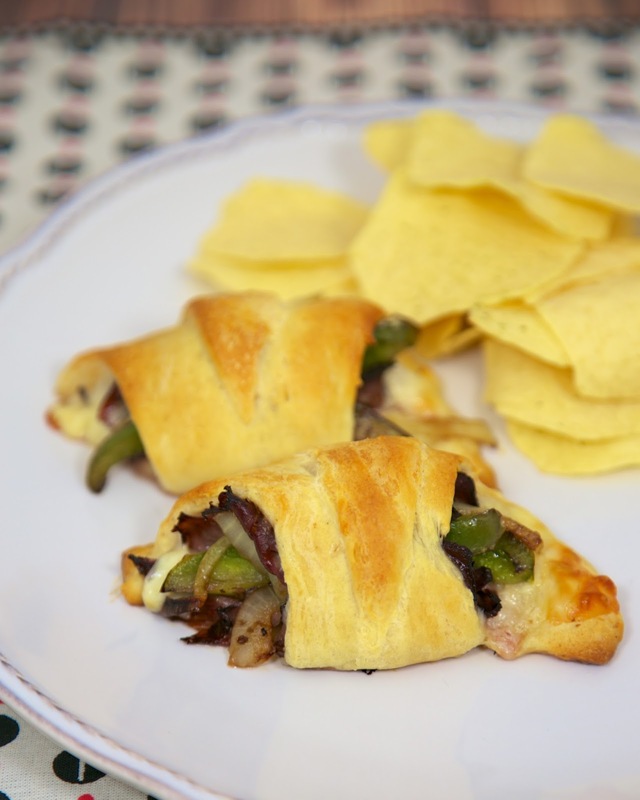 I couldn't get those cheesesteaks out of my head, so I whipped up these Philly Cheesesteak Style Crescents. We both loved them! I know these crescents aren't authentic cheesesteaks, but they have all the flavors. Plus, they are easy enough to make for a quick lunch or dinner. In a saute pan, melt butter. Add onion and pepper. Cook until soft, about 5 minutes. Set aside. Separate crescent rolls into 8 triangles. Spread 1/2 teaspoon horseradish sauce on each crescent. 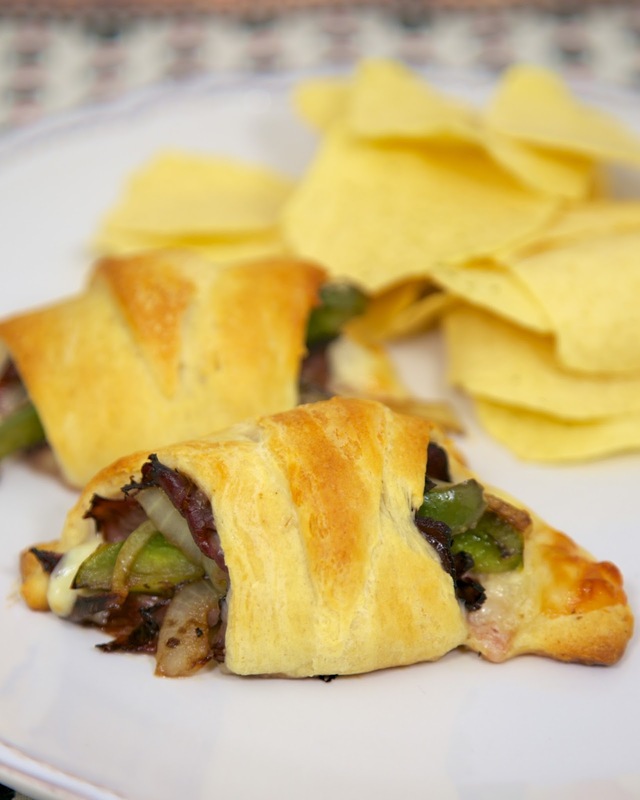 Top each crescent with 1/2 slice provolone cheese, roast beef, and a few slices of onions and peppers. Roll up crescents and place on baking sheet. I adore your recipes! I have only been following your blog for a short while but have tried more recipes here than a lot of other food blogs I follow! What a great idea - they look yummy! I think I'll give them a try this weekend for an easy lunch. Stephanie, I ran a B&B called the Antebellum Inn for 7 years. My frittatas were very popular. One day a niece was having a Philly Cheesesteak sandwich for lunch. I kept looking at it. Later that week I served my first Philly Cheesesteak Frittata at breakfast. I did cut the beef into strips. When I sauteed the onion & pepper until they started to soften, I added the beef and 6-8 beaten eggs. The provolone I shredded and added half to skillet. Stir for a minute or two and gently let it cook until it starts to set up. Add the rest of the cheese and pop under the broiler set at 350 degrees. You want the top portion to set up and start to brown. You can check for doneness to make sure the eggs are done. It's pretty rustic and won't show a little cut. The original sandwich came with a little cup of Ranch dressing for dip. I just drizzled a little Ranch across the top. Cut into pie-shaped slices. So pretty on a plate with the Ranch dressing drizzle!! Tastes great too!! Ooops! I did salt & pepper the eggs. Seems like it was a 1/2 tsp of salt and less than that of pepper. I've cooked for many decades and have a tendency to "fly by the seat of my pants". Hahaha!